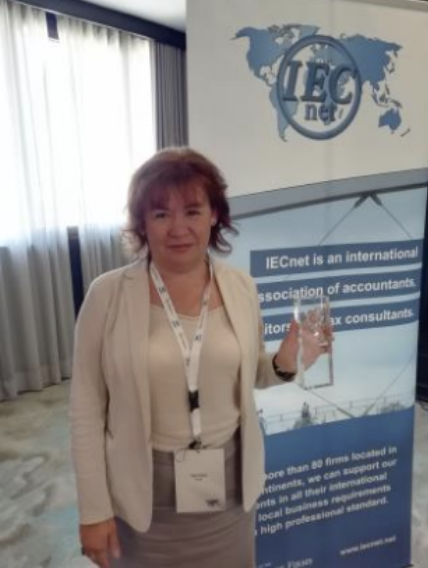 IECnet, the international network of accountants, auditors and tax advisors, has chosen its member of the year 2018-2019. The award goes to BIG 5, Russia, for their very active work in the IECnet Committee on Auditing, IECnet Audit presentations during IECnet meetings & updating the IECnet Audit Manual in the IECnet Intranet. BIG 5 also hosted an impeccable EMEA in a country where IECnet had not have a meeting before. Irina Galay, CEO of BIG 5, present at the Lisbon AGM 2018, was honored to receive this trophy. BIG5 was established by Mrs. Irina Galay in January 2001 under the name “Verdict“ in St. Petersburg, Russia. In July 2013 they were renamed as “BIG5“. They became IECnet members in 2016. Their IFRS Services Director has been appointed a member of the IECnet Professional Practice Committee of the Committee on Auditing, responsible for coordination of Quality Reviews, organization of Training Programs for IECnet member firms, as well as Technical Consultations on IFRS and ISA matters to IECnet member firms. For more information, please go to www.iecnet.net.